As the population ages, more and more homeowners are opting to stay in their homes longer. A Harvard University study said in 2017, homeowners who wanted to age at home spent $40 billion on renovating kitchens and bathrooms. In 1997, that number was $21 billion. Todd: I can believe the number of people that are aging, just like you and me, we’re all getting a little older and the alternative is not a good one. I have a good friend with me, Keith Howard. He’s the owner of American Therapy Tubs. Tell us about your business. Tell us what you do, and about these beautiful walk-in tubs that you specialize in. Keith: We specialize in adaptive living. In other words, making changes to homes so people who have a disability, or a challenge; we make their life easier and allow them to be in their home safer, for longer. 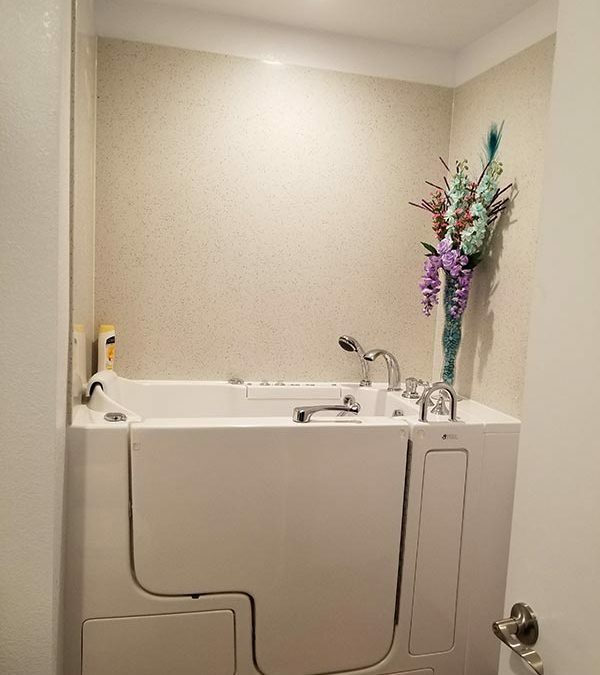 Explain to people Walk-In Tubs features. In case they’ve never seen one. Keith: They’re basically a self-contained, and more often a spa, that we install in place of a typical tub. They allow somebody to be able to enter and exit the bath safer, and to stay in it safer while they bathe. These tubs were not designed specifically for the elderly. It’s a European concept. It’s been around for over 40 years in Europe. When you go to sell your home, you take your appliances, your fixtures, your kitchen cabinets with you. So, that whole Ikea modular cabinet thing is not a new idea. It’s actually an old idea. These tubs are a self-contained unit. They can actually be moved and put in another space if somebody wanted to move. You could take these tubs with them. How long have you been doing this because you did not always sell tubs? Keith: My whole family is in the senior care industry, so I’ve been around Aassisted Living facilities for a long time. I used to be a real estate consultant to the industry. I probably been inside more assisted living and skilled nursing facilities than most people. Once I saw that demographic, I thought it would be really great to be able to become part of it, and in a more specific way. I actually worked for a guy who had a large company. They put these tubs in and I saw what they were but they didn’t typically offer the kind of options that we now offer. There was basically one tub; one-way, and for one price. I realized that they didn’t fit everybody, as far as an individual or space in the home. So I found a company that allows us to diversify. What if people are interested in learning more about American Therapy Tubs. What’s their first step? Keith: Once we’re contacted, they can either come and visit our showroom which is in Elk Grove, or we will come to see them. There’s no cost to do any of this. We have a tub where they can experience the benefits of hydrotherapy in our showroom. Todd: I’m glad you talked about that because that is a great idea. These tubs range from $9000 to $16,000, and all the way up to $20,000. These are not cheap dates. They’re very well worth it. And you have a working tub in your showroom that you can fill up, give the people privacy, and check the unit out right there. Keith: That’s correct. We have 19 different models of tubs and we custom build every tub so the tubs built specifically for the customer. They don’t have to buy options they don’t think they would use, but the options are there if they want them. Todd: What are those options? Because, one of the biggest concerns that customers have shared with me was they really want to shower-head, and not just a tub. But, low-and-behold, the tubs come with showers now. Keith: Yeah, we can accommodate just about anybody with one of our tubs. The benefits of bathing and hydrotherapy are immense. The New England Journal of Medicine published an article about the benefits of these tubs. They list 50 different ailments from diabetes, gland function increases, and circulation increases, to name a few. So feel better, and your body actually functions better. You can call us at 916-685-0888, and if you mention this segment you get $1,000 off the installation of one of our Amerian Therapy Walk-in tubs. Todd: How cool is that? You’ve got to see the showroom. You have to see these different models. I can only imagine the weight you’re going to take off homeowners. Actually, I took note when I was in your showroom is how beautiful the units are. This is like a piece of furniture in your home. Keith: It’s beautiful, and when we build them in, it looks like it’s supposed to be there. That’s the key to have the tub fit in your home and not stick out like it doesn’t belong there. Todd: Let’s talk about size of the tubs. We’re taking out a standard 5 foot tub, and this is going to go into that area. Keith: We can go all the way down to a typical stall-shower as you’ll see in an older home. We’ve got a tub that actually fits inside there. You’ll be surprised how much room is in that tub; all the way up to a full 60 inches along the top. So if you’re interested, come by the showroom and take advantage of the $1000 off the installation of one of our products. Give us a call at 916-685-0888 and we’ll be glad to set up a time to see you. Todd: Go down a list of the options that these tubs come with. It’s not just turning on the hot and cold sitting there filling up. There are a lot of toys to play with. Keith: Lots of toys. Everything from Hydrotherapy which is a Whirlpool system. An air system. Our micro bubble system is probably one of the most beneficial systems put in these tabs. Everything from aromatherapy, to light therapy, you name it these tubs have it. Heated seats. They are really a special unit. Todd: So, while that water is draining you have a system now where it’s a quick-release, fast flow drain system. Keith: These tubs will typically drain in under two minutes. Under two minutes. Todd: While you’re sitting there, you’re not freezing to death. You have heaters around you. Keith: We design tubs to fill quickly and drain quickly. That’s the first question we typically get from somebody who’s considering one of our tubs. Do you have a news tip for our Show Prep on AsktheContractors.com? Send us a comment on the home page. Question: Payment Schedules. How much & when?